Rhodes or Rodos (Greek: Ρόδος, Ródos, [ˈroðos]) is the principal city and a former municipality on the island of Rhodes, in the Dodecanese, Greece. Since the 2011 local government reform it is part of the municipality Rhodes, of which it is the seat and a municipal unit. It has a population of approximately 80,000. 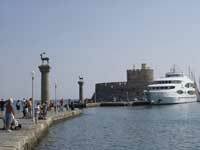 Rhodes has been famous since antiquity as the site of Colossus of Rhodes, one of the Seven Wonders of the World. The citadel of Rhodes, built by the Hospitalliers, is one of the best preserved medieval towns in Europe which in 1988 was designated as a UNESCO World Heritage Site. The City of Rhodes is a popular international tourist destination. The city of Rhodes is situated in the north-east tip of the island and forms a triangle from north to south. It is the smallest municipality of the island in terms of land area and the largest in population. It borders with the Aegean Sea in the north, the east and the west and with the municipalities of Ialysos and Kallithea in the south. Apollo Temple at the Acropolis of Rhodes. Remains of the Temple of Aphrodite, c.3rd century BC. View of the Palace of the Grand Master of the Knights. The "Avenue of the Knights". The island of Rhodes is at a crossroads between Europe, the Middle East, and Africa. This has given the city and the island many different identities, cultures, architectures, and languages over its long history. 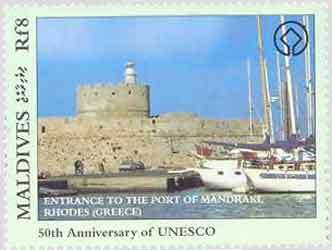 Its position in major sea routes has given Rhodes a very rich history. The island has been inhabited since about 4000 BC (Neolithic Period). The city of Rhodes was formed by the cities of Ialyssos, Kamiros and Lindos in 408 BC, and prospered for three centuries during its Golden Age, when sea trade, skilled shipbuilders, and open-minded politicians of the city kept it prosperous until Roman times. The Colossus of Rhodes, one of the original Seven Wonders of the Ancient World was built by the Lindian sculptor Chares between 304 and 293 BC, which took 12 years and was completed in 282 BC. The statue represented their sun god Helios, which stood at the harbour entrance. 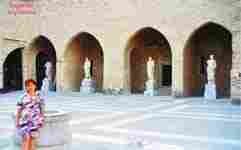 The ancient city had a well-constructed sewage system as well as a water supply network as designed by Hippodamus. A strong earthquake hit Rhodes about 226 BC, badly damaging the city and toppling the Colossus. For the next eight centuries it lay in ruins until it was sold to a Jewish merchant, reputed to require 900 camels to haul it away. In 164 BC, Rhodes became part of the Roman province of Asia. It was able to keep its beauty and develop into a leading center of learning for arts and science. Many traces of the Roman period still exist throughout the city and give us an insight into the level of civilization at the time. According to Acts 21:1, the Apostle Paul stopped at Rhodes near the end of his third missionary journey. In medieval times, Rhodes was an important Roman trading post, as also a crossroads for ships sailing between Constantinople and Alexandria. In the early years of the divided Roman Empire, the Isaurians, a mountainous Tribe from Cilicia, invaded the island and burnt the city. In the 7th century it was captured by the Arabs. The latter were the ones who removed the scattered pieces of the Colossus from the port and moved them to Syria where they destroyed them to make coins. After the fall of the Roman Empire in 1204, the native noble Leo Gavalas took control of the islands, but after his death and succession by his brother, the islands were returned to the Emperor of Nicaia, though ushering in a new, but short-lived, Byzantine period. 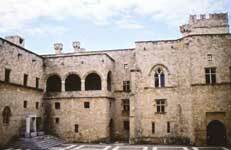 The Knights Hospitallers captured and established their headquarters on Rhodes when they left Italy after the persecution of the Knights Templar in 1307. Pope Clement V confirmed the Hospitallers possession of the Island in 1309. 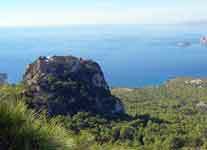 The Knights remained on the Island for the next two centuries. In 1444, the Mamluk fleet of Egypt laid a siege to Rhodes, but the Knights aided by the Burgundian naval commander Geoffroy de Thoisy beat off the Muslim attack. After the Fall of Constantinople in 1453 the Ottoman Empire began a rapid expansion and in 1480 Sultan Mehmet launched an invasion of Rhodes commanded by Mesic Pasha. The defenders repelled Turkish attacks from both landward and seaward sides and the invaders left the Island in defeat. The defeat halted a concurrent invasion of the Italian peninsula by Ottoman forces and prevented possible Muslim incursion and control of Western Europe. After the Ottoman defeat in 1480 the Knights Grand Master, Fabrizio Del Carreto, oversaw the strengthening of the cities over the next few decades. 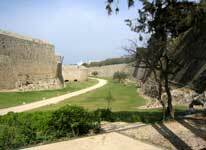 By the time of his death in 1521 Rhodes possessed the strongest fortifications of any Christian Bastion in the World. The continued Naval attack launched from Rhodes on Muslim Merchants until 1522 the newly enthroned Sultan Suleiman the Magnificent led a second Siege of Rhodes (1522). The vastly outnumbered Knights made a spirited defense of the city and inflicted heavy casualties upon the Ottoman besiegers. In December 1522 the Knights and Suleiman came to terms and the Knights were allowed to leave the city with all the wealth they could carry, in return there would be no retribution upon the inhabitants of the city and they would be allowed to continue to freely practice Christianity. 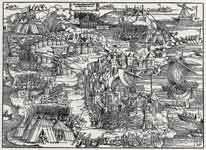 On January 1, 1523 the Knights departed from the island, leaving it to Ottoman control. View of the Market ("Nea Agora") of Mandraki, built during the Italian period. In the Ottoman era, new buildings were constructed: mosques, public baths and mansions for the new patrons. The Greeks were forced to abandon the fortified city and move to new suburbs outside its walls. The city maintained its main economic function as a market for the agricultural products of the interior of the island and the surrounding small islands. After the establishment of their sovereignty οn the island, the Ottoman Turks converted most of the churches into mosques and transformed the major houses into private mansions or public buildings. 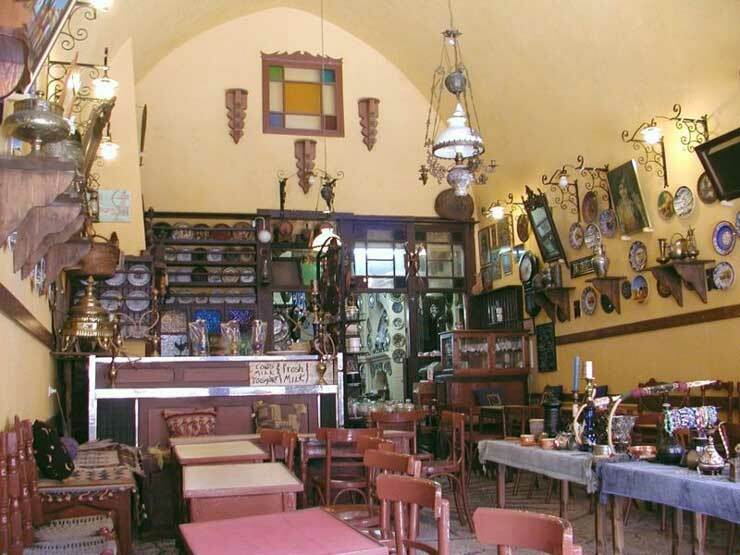 This transformation was a long-term process that aimed to adapt the buildings to the Ottoman way of living. The Knights period facades with their sculptured decorations, the arched gates and hewn stone walls were enriched with the random character of the Ottoman architecture adapted to the local climate and culture. 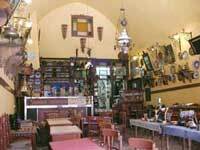 Ιn this process most οf the architectural features of the existing buildings were preserved. The most characteristic additions were the baths (usually in the back of the buildings) and the enclosed wooden balconies οn the facades over the narrow streets.In this way most of the buildings of the Hospitaliers' period in the Medieval Town were well preserved. The result was a mixture of oriental architecture with imposing western architectural remains and more recent buildings, which were characteristic of the local architecture of the time. Ιn the 19th century, the city was the capital of the Eyalet of the Archipelago, but the decline of the Ottoman Empire resulted in the general neglect of the town and its buildings, which further deteriorated due to the strong earthquakes that often plague the area. 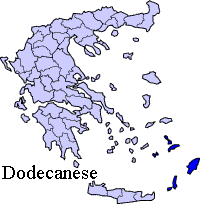 In 1912 Italian troops took the island over with the rest of the Dodecanese Islands, and established an Italian colony known as Isole Italiane dell'Egeo in 1923. The Italians would later demolish the houses that were built on and around the city walls during the Ottoman era. 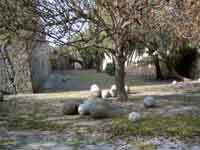 They also turned the Jewish and Ottoman cemeteries into a green zone surrounding the Medieval Town. 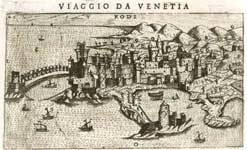 The Italians preserved what was left from the Knights' period, and destroyed all Ottoman buildings. They also reconstructed the Grand Master's Palace. Furthermore, an Institute for the study of the History and Culture of the region was established, and major infrastructure work was done to modernize Rhodes. The British bombs that fell on the medieval city of Rhodes in 1944 claimed human lives and destroyed a great number of buildings, leaving large gaps in the urban tissue. One of the first Decrees of the Greek administration designated those areas as reserved for future excavations and a number of edifices as safeguarded buildings. In 1957, a new city plan was approved by a Decree and in 1960 the entire medieval town was designated as a protected monument by the Ministry of Culture. In 1961 and 1963 new Decrees were issued concerning the new city plan. They provided for the widening of existing streets and the opening of new ones. 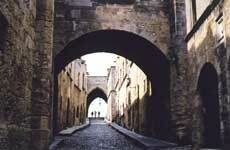 These were not implemented in the old city due to the resistance of the Archaeological Service. 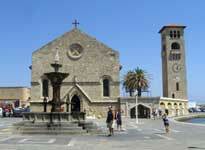 In 1988, the old town of Rhodes was designated as a World Heritage City by UNESCO. Rhodes is the capital of the island of Rhodes and of the Dodecanese Prefecture. The city hosts both the City Hall and the Prefecture Hall and as a form of recognition holds also a regional office. Panoramic view of Rhodes harbour. Panoramic view of Rhodes city. Panorama of the interior of the Grand Master's Palace. Street of the old city. Holocaust memorial at the Jewish cemetery. 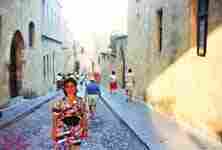 Rhodes had a significant Jewish population until World War II. The city is home to numerous landmarks. Some of them date back to antiquity and most of the others remain from the Knights' Period. Gothic buildings in the historical upper town. Recently, the Byzantine harbor was excavated, discovering unique medieval shipwrecks. Both city and island population continue to grow contrary to national levels; the city has an official population of 54,000, but the actual population is estimated between 115,000 and 120,000. This is caused by many permanent residents of the city registering in their place of birth during the census. Thus the city's total population, as counted by the census, is less than the number of people actually residing in the city. Currently it is estimated that 120,000 people reside permanently in the city although last census showed only 54,000. The last years two private schools were also established and offer classes from primary to lyceum education. Laocoön and His Sons; Grand Master's Palace. The road network of the city is gradually becoming insufficient as the car fleet expands at a rate of 5,500 per year thus making both traffic and parking an increasing concern for the city officials, especially during the high-season (about 70,000 cars move from/to the center per day). The Medieval Town closes for vehicles during the summer so all the traffic gathers outside the walls and towards the modern city center which has mainly narrow and one-way streets. Finding a parking space is difficult and moreover it is under a fee. Direction signings on the streets are sufficient. From the south end of the city begins the E-95, the national road that connects the city with Lindos. Bus service within the city is currently inefficient as the local municipal transport company (RODA) is almost in bankruptcy. Its fleet is old and small, the routes are inconvenient and without specific timetables and finally, lack of serious management over the years undermine a probable future return in reliability and profits. Note though that during tourism season the company serves as well as possible all the main resorts and attractions contrary to winter time when services are below standard. Taxis in the city are plentiful during winter but are scarce in the summer due to high tourism. About 400 taxis serve the city and can be either found in specified taxi ranks or by phone. The city hosts four harbors; the central serves national and international traffic (ferried and cruise ships), Akandia harbor is currently in construction servicing mainly cargo ships and cruise ships on busy days, Kolona serves in-prefecture traffic and private yachts and finally Mandraki harbor services daily trips around the island and small yachts. The new Marina of the island is being constructed in the Zefyros area and is expected to be operational by 2009. Diagoras International Airport of Rhodes serves both city and the island. It is situated 14 km south west of the city. It is connected to all major Greek airports and Cyprus throughout the year and during tourism season accepts heavy charter traffic. Most major nation-wide television stations broadcast in the city. There are also five local television stations and a number of local and national radio stations. There are three daily newspapers issued that deal with both the city and the whole region. Moreover two are issued every Monday and there are few others with specific themes. The city after a long dark period of almost 15 years is reviving in many team sports. Football and basketball are the most popular but a wide variety is also in development during the last years with the most noticeable in rugby. 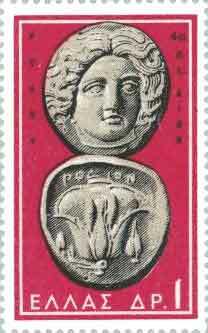 The emblem of Diagoras GS. The city has two major football teams; Diagoras GS and AS Rodos after a long period are back in national level and compete in Greek National Second Division (Vita Ethniki) while the rest of the city based teams compete in the local Amateur Divisions. The last 15 years basketball is represented in national level by Kolossos Rodou BC which currently won promotion to National A1 Ethniki just one year after being relegated. Other notable teams are AS Diagoras Rhodes which just gained promotion in National Third Division and AS Dodekanisos, the pride of the Aegean that competes and stars in the national basketball league for handicapped people. A variety of other sports is also available and in development in the city. In volleyball AS Diagoras Rhodes lost in the third division and returns to the local leagues; in rugby the recently formed Colossoi of Rhodes reached the top league finals for the second time in a row. The Nautical Club of Rhodes and Ygros Stivos of Rhodes have water polo teams in low level national divisions; the Rhodian Tennis Club play tennis and ping-pong in its privately owned facilities; AS Diagoras Rhodes have competitive teams in cycling and in track and field athletics. Finally ziu zitsu, karate, tae-kwon-do and other Eastern oriented sports are available with local teams that enjoy sporadic national success. The city has three major sports venues; the Rhodes Municipal Stadium and the Kallipateira National Athletic Center serve all outdoor activities while the Municipal Indoor Hall of "Venetokleio" serves indoor sports. Pitaroudia, traditional food from Rhodes and Dodecanese. The city of Rhodes is also home to many foreign consulates. 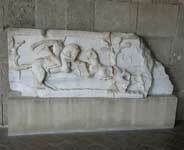 ^ a b c d "History of Rhodes: Classical Period". Municipality of Rhodes. www.rhodes.gr. 2007. Retrieved 2007-03-31. 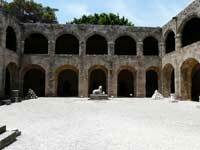 ^ a b "History of Rhodes: Roman Period". Municipality of Rhodes. www.rhodes.gr. 2007. Retrieved 2007-03-31. 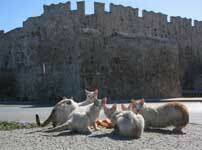 ^ a b c d "History of Rhodes: Italian Period". Municipality of Rhodes. www.rhodes.gr. 2007. Retrieved 2007-03-31. 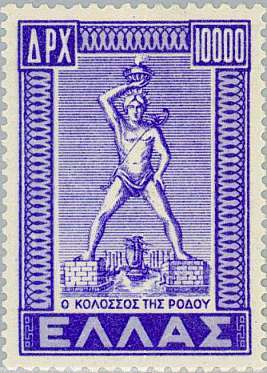 ^ "City of Rhodes". Rhodes.gr. Retrieved 2009-01-16. ^ "Tourists Information: Foreign States Consulates". Municipality of Rhodes. www.rhodes.gr. 2006. Retrieved 2007-03-31.